Non-aerosol fragrance dispensing system with battery operated pump mechanism. This unit dispenses a fragrance into the air at programmable set intervals effectively destroying unpleasant odours. Visually attractive modern fragrance unit made from tough durable Polypropylene plastic with lockable satin stainless steel cover. Extremely economical through the use of its specially designed 200ml fragrance refill (a non-aerosol ethanol based liquid) which provides up to 3800 atomized sprays. The unit contents is fully lockable, incorporating the sturdy SNAPLOCK automatic locking system which unlock/opens with the unique Serra® barrel key. It provides a constant and consistent purified perfumed spray, maintaining fresh and pleasant smelling environment. The unit is fully programmable to suit all your specific needs. The state-of-the-art Control System allows monitoring of fragrance level and battery life, creating a convenient and hassle-free unit. It functions under normal atmospheric pressure, no wastage, no leaks. The dispenser comes with a full twenty-four (24) month repair/replacement guarantee. An essential up-market washroom accessory. The dispensing method of the Serra Air 2 system is through a battery operated pump mechanism. At the specified interval, the nozzle on the fragrance refill is 'pressed-on' by the unit, thus atomizing and spraying the fragrance into the air, effectively destroying unpleasant odours. The innovative non-aerosol fragrance dispensing concept, i.e., liquid contained in a completely sealed nozzle-operated container, eliminates the disadvantages of the aerosol-type canisters. The more conventional aerosol "pump" is not the most reliable when it comes to leaking and the all-important spray-action. The refill nozzle of the Serra Air 2 is guaranteed not to leak and will be in the right position when the time comes for it to be activated. The Serra Air 2 System utilizes an IC Digital Control System and dynamic RAM to program the spray intervals, which prolongs the battery and refill life. Top quality batteries will only need replacing every three (3) months. The fragrance refill will only need to be replaced every two (2) months (on a 12-hour operation at 15-minute spray intervals) or one (1) month (on a 12-hours operation cycle at 8 minute spray intervals). 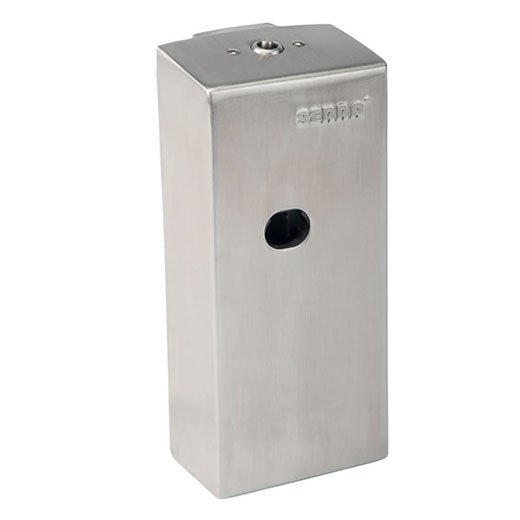 Lockable unit prevents theft, unauthorised programme changes, etc.